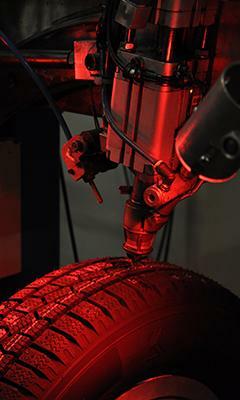 In order to ensure the retention and longevity of studs, it is important that the winter tyre is studded correctly. The tyre should be studded with as little stud protrusion as possible, when the hard alloy pin of the stud is about 0.5 mm above the tyre surface. A quiet run-in of 500 km is sufficient for the tyres studded like this. If it is desired that the winter tyre is studded with 1.2 mm protrusion, the hard alloy pin will be completely outside the tyre tread surface. For the tyres studded like this, a moderate run-in of 1000 km is advisable, during which powerful accelerations and braking with wheels locking up should be avoided. A quiet run-in will give the studs some time to set firmly in the tyre rubber compound. Do not use stud protrusion exceeding 1.2 mm. If the stud body is above the tread surface, the stud cannot be retained in the tyre, and the excellent winter driving characteristics of the studded tyre are lost.